The long-awaited rematch between UFC light heavyweight champion Jon Jones and Alexander Gustafsson, scheduled for UFC 178 in Las Vegas on September 27, has been postponed after the Swede suffered an injury in training this week. Although there are scores of hungry challengers waiting for a crack at Jones’ crown, few can rival Daniel Cormier's burning desire to topple the champ at the MGM Grand Garden Arena. And now that matchup is set. UFC officials made the announcement of the main event switch to Jones vs. Cormier on Wednesday. 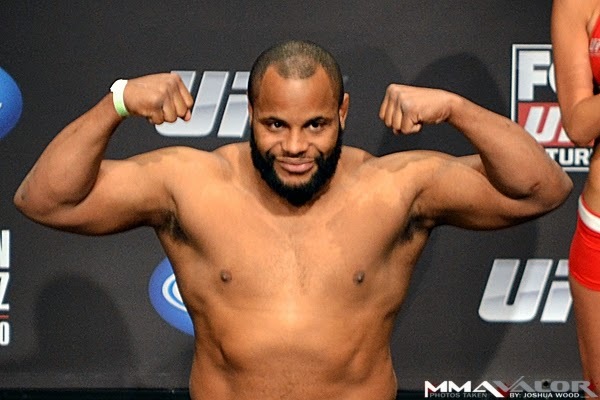 The unbeaten Cormier, a two-time Olympic wrestler and former heavyweight contender, has long had his sights set on Jones, with his move to 205 pounds in 2014 predicated on a shot at his longtime rival. Since his move, the 35-year-old Louisiana native has stopped Patrick Cummins and Dan Henderson, and following his submission of “Hendo” in May, he made no secret of his desire to meet his fellow wrestler as soon as possible. The 27-year-old Jones, champion since 2011, has made a record-setting seven successful title defenses at 205 pounds, with wins over former champions Quinton Jackson, Lyoto Machida, Rashad Evans, and Vitor Belfort. In his most recent bout, Jones decisioned Glover Teixeira at UFC 172 in April, and while the plan was for Jones to meet Gustafsson in a rematch of their classic 2013 bout, the champion expressed his desire to fight Cormier first, even before the contracts were signed. But after Gustafsson’s unfortunate injury and subsequent removal from the UFC 178 card, both Jones and Cormier will get the fight they wanted all along, and the fans get a fitting main event for a stacked card that also features Irish star Conor McGregor vs. Dustin Poirier, the return of Dominick Cruz vs. Takeya Mizugaki, the middleweight showdown between Tim Kennedy and Yoel Romero, and Cat Zingano’s comeback bout against Amanda Nunes.